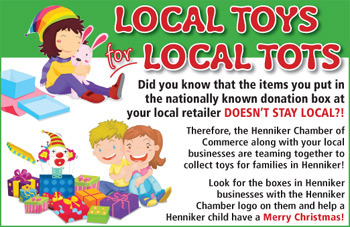 Henniker Chamber Of Commerce Local Toys For Local Tots Toy Drive - Henniker Chamber of Commerce, NH ? Henniker, NH, November 9, 2018 - The Henniker Chamber of Commerce continues a “Local Toys for Local Tots” Toy Drive for Henniker children. Since items put in the nationally known donation boxes at local retailers don't stay local, the Henniker Chamber of Commerce teamed up with local businesses to collect toys for families in Henniker. Local Toy for Local Tot boxes will be put out the week of November 19th and are scheduled to be picked up Friday, December 14th. Boxes are set up for drop off locations including the Henniker Farm & Country Store, Henniker Pharmacy, Intervale Pancake House, Henniker Brewing Company and Edmunds Ace Hardware.